Many believe that Halloween is for children, but I completely disagree. The celebration of Halloween grows with us in stages. As a child, we dress up as our favorite superheroes and pop stars. As young adults, we hang out with our friends and go to parties. When we enter our professional career, it’s all about the office party and eventually, as a parent, Halloween revolves around dressing up kids in their costumes and passing out candy. The other big part of Halloween is the decorations and this year, I found some clever ways to recycle my collection of Loudoun wine bottles. There are tons of Halloween crafts that require wine bottles and corks, so invite your friends over, drink some wine and spend the night making these fun fall decorations for your home. 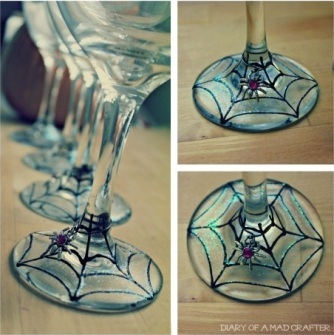 Turn your collection of LoCo wine glasses into Halloween decorations with this simple project. It doesn’t have to be glittery and you could also use a paintbrush instead of a squeeze bottle, but a squeeze bottle might be easier. Ghost candle holders are an easy, fun and quick craft that will add a little ghoul to your home for the Halloween season. This craft you will have to prepare for in advance because you need 34 wine corks! Ask for a little help from your friends and enjoy some, and by some I mean a lot of, Loudoun wine then make this beautiful cork pumpkin. This craft also requires you to drink some wine for preparation, which is definitely not a bad thing. 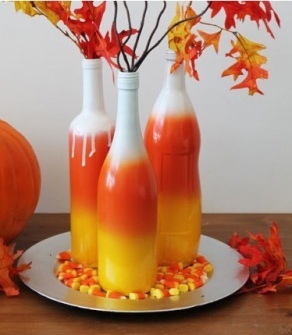 The ombre wine bottles are quick and easy and brighten up any room for the fall and Halloween season since they resemble yummy candy corn. Spray paint (preferably outside) the middle section of the wine bottles orange. Don’t worry about it being perfect. After the orange dries, spray paint the bottom portion of the bottle with the yellow spray paint and you’re done! If you want to get more creative, then add a second layer of any of the colors to make the paint run down the bottle into the other colors. 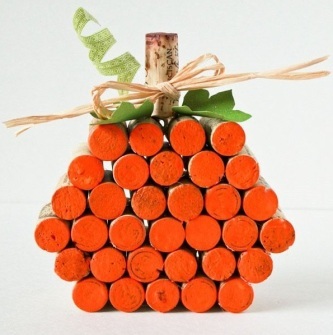 With these fun wine bottle and cork crafts, you can have your Halloween decorations and drink them too! For more wine bottle and cork crafts, check out our Pinterest board.